One viewing of a Wes Anderson film simply isn’t enough. His films are like the aftertaste of a good meal that won’t go away, and you never want them to go away. Or, a painting where you notice more going on in the background with a more watchful eye. Or, an even more apt comparison here, like a symphony that sounds even better when broken down into smaller pieces. In “Moonrise Kingdom,” young heroine Suzy Bishop (Kara Hayward) looks at everything through binoculars. She says that it makes things look closer, even when they aren’t very far away. She also believes it is her super power. I like to imagine that Wes Anderson looks at every film he makes through a pair of binoculars, and that he shares this super power with Suzy: he can see every minuscule detail of life up close in the most vivid of ways. Through each one of his works, Anderson is inviting the audience more and more to stare into the binoculars at the idiosyncratic universe he has created. After seeing “Moonrise Kingdom” at Cannes, I immediately knew that one viewing wouldn’t suffice. And while I try my best to go in with little to no expectations, I knew I would like it better the second time around. And that I did. 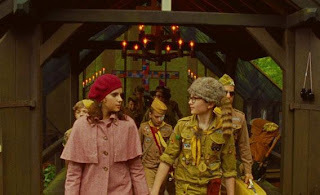 It is not that I didn’t like “Moonrise Kingdom” the first time around, it is just that I liked it for different reasons. The first time, I liked it because the Transitive Property of Wes Anderson* required that I like it. I liked it even more on viewing number two because I saw that once again, Wes Anderson defied his detractors and made yet another film in which the characters were more than just cutouts standing against pretty backdrops. “Moonrise Kingdom” has had its fair share of detractors. Well, most negative reviews were actually positive, with some critical things to say. Many have complained that Anderson’s style and tropes have become too predictable. It is true that there are certain things you will find in every Wes Anderson film, but that is what makes him such a great filmmaker. He tells the same story only loosely every time he makes a film. Like his past works, “Moonrise Kingdom” is about adults who act like children, and children who think they’re adults. Like any good director, Anderson is constantly trying to improve on the template he first created. On a second viewing, I realized the opening, is more than just a tour of the Bishop household and all of its members. It serves the same purpose as the opening of “The Royal Tenenbaums.” When looking at it through that lens, it makes it even more impressive: characters, and a story, are introduced without saying a single word. Here, we learn that Mr. and Mrs. Bishop can spend their time close to each other, without saying a single word to the other. 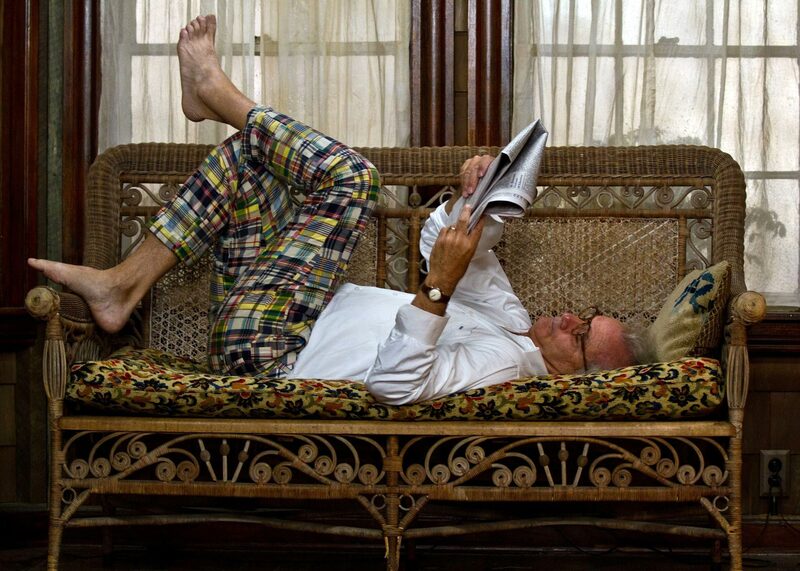 Mr. Bishop (Bill Murray) lying in a fetal position shows something of a surrender to misery. Mrs. Bishop’s (Frances McDormand) arduous routine shows a predilection toward self-preservation. And then there’s Suzy, sitting above her brothers almost in a separate sphere, reading one of her many adventure novels. Well, everyone in this family seems to be in the Bishop household seems to be in their own little sphere, with the exception of the three little boys. Shortly after, we are introduced to the fourth wall breaking narrator (Bob Balaban). With the narrator, Anderson has to break a few cinematic rules in order to introduce the fictional island of New Penzance to the audience, as well as the future hurricane. At this point, Anderson has earned the right to break those rules, because he does it right. With the exception of “Fantastic Mr. Fox,” Anderson’s other films took place in slightly fantasized versions of real places. In “Moonrise Kingdom,” Anderson invented a place that he can call his own. “Moonrise Kingdom” is a fantasy tale about two children trying to live out a fantasy of their own. Then, we are introduced to the Khaki Scouts, another thing that doesn’t exist, yet is a variation of something in reality. That is a good way to define much of Anderson’s work. 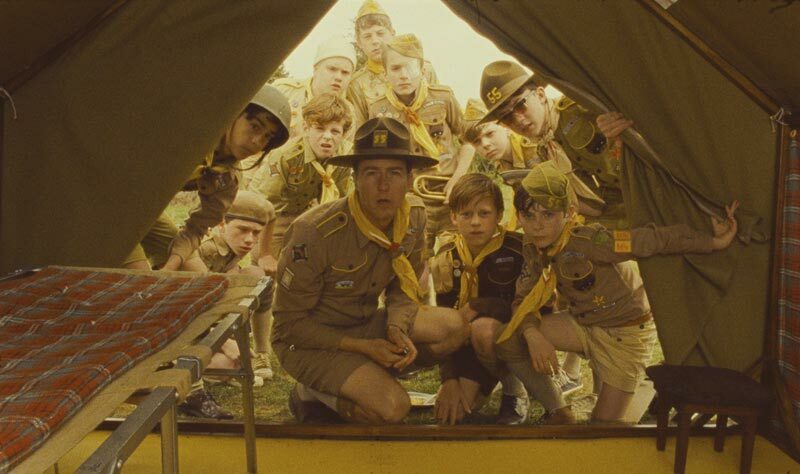 We meet everyone from Scout Master Ward (Edward Norton), who is a Scout Master first and a math teacher on the side, to the boy with the eye patch (we never do find out his real name). That the entire troop of scouts a family, and many other characters can be so well developed in just 90 minutes is a testament to the power of great writing. Usually, an entire TV series would be needed to delve in to this many characters. Anderson has the power to define someone’s entire personality in just one line of dialogue. Anderson has another power that is known to most, but doesn’t truly come out until a second viewing. I realized this time around that the characters in all of Anderson’s films exist loosely in a similar world that is not quite our own. This is a world where people act pretty terribly toward each other, and have trouble expressing their true feelings through words. So instead, they define themselves through the clothes they wear, the way they decorate their homes, and the culture that they consume. Look closely and you’ll notice a heavy use of the colors yellow and brown throughout “Moonrise Kingdom.” You can see it in the Khaki Scouts, as well as Sam’s (Jared Gilman) foster home, from his foster father’s yellow and brown plaid shirt, to the chocolate cake that his foster mother is covering with yellow icing in the background. Perhaps it represents a world that is ripe on the outside, yet a little dark on the outside, or a cast of characters who are “yellow” (cowardly). I also found the second time around that the film is much funnier than I first thought it was. Once again, and I cannot say this enough, it is all about the little things. For example, notice how Sam keeps an inventory list of all of Suzy’s things, or the group of kids in the background of one scene trying to play their recorders. Also, I will mention the very hilarious irony of seeing Jason Schwartzman play a preist. And yes, it’s also funny to see that treehouse, and it’s even funnier (and makes total sense) to see a kid carry around $76 in change. Every kid at one point or another had that much change on them for no good reason. Working on a Wes Anderson film must be an actor’s paradise. He gives them so much good dialogue and characterization to work with. He has kick-started the careers of its two incredibly promising leads, Hayward and Gilman, who bring equal amounts of heart and humor to the film. I believe one day the two of them will run off once again to become Margot Tenenbaum and Eli Cash. The boy with the lazy eye will probably become Dudley. Sam and Suzy also remind me of a younger version of Bonnie and Clyde, minus the bloodlust. The story of “Moonrise Kingdom” also felt a little bit like a twist on Terrence Malick’s “Badlands.” The indelible image of Sam and Suzy dancing on the beach to Francoise Hardy’s “Le Temps de l’Amour,” equal parts cute, creepy, and awkward, felt like the scene where Kit (Martin Sheen) and Holly (Sissy Spacek) dance along to “Love is Strange.” Both scenes contain the childlike wonder for trying something completely new. Anderson’s films are often criticized for not having enough heart. But “Moonrise Kingdom” is one of those films that I just wanted to give a giant hug too. It is pretty on the inside, and the outside. Its intentionally cheesy special effects never make it seem dated. While some have said this film could have taken place during any year, I believe 1965 is the perfect fit. Seeing characters chart out territory on real maps is way more interesting than someone trying to figure out where they are going on Google Maps. Perhaps New Penzance is trapped in the past, just like all of its characters, while the outside world moves on. And for that, I actually think it is better off. One more note I believe it is proper to end on: the music. It is true that “Moonrise Kingdom” does not have the most standout soundtrack of all of Wes Anderson’s filmography. British Invasion is replaced with British Classical, and there’s a tinge more French than usual. But maybe these characters aren’t ready for The Kinks yet, at least not until they figure out how to put Benjamin Britten’s orchestra together. *If it includes elaborate sets and anything vintage, then it must be Wes Anderson, and it must almost always be good. This entry was posted in 1960s, Bill Murray, Edward Norton, Jared Gilman, Kara Hayward, Moonrise Kingdom, On A Second Viewing, The Royal Tenenbaums, Wes Anderson on June 16, 2012 by ian0592.